The report, released in JAMA Internal Medicine, suggests that some people turn to cannabis as a way to treat their pain, consequently avoiding more dangerous pharmaceutical drugs as a result. Many people become addicted to opioid painkillers when they are prescribed the drugs to treat legitimate pain. The authors of the study say that people who avoid that first prescription are less likely to become addicted to opiates. No one has ever died from a marijuana overdose (no one!). Based on the National Academy of Sciences, Engineering and Medicine’s own assessment that marijuana is useful in treating various types of pain, Bradford and 3 colleagues set out to determine whether people with easy access to medical marijuana are less likely to receive prescription opioids. The researchers pored over data from Medicare, which mostly covers people over the age of 65. They discovered a 14% reduction in opioid prescriptions in states that have medical marijuana laws. An estimated 3.7 million fewer daily doses of opiates are prescribed in states with medical marijuana dispensaries, the authors said. States that allowed residents to grow their own medicinal marijuana saw an estimated 1.8 million fewer opioids dispensed each day. From 2010 to 2015, Medicare recipients received approximately 23 million daily doses of the analgesics. During that same period, opioid use was skyrocketing, so the numbers reflect a slowing of the increase, rather than an actual decline in opioid use in these states, according to Bradford. The study merely shows a correlation and can’t prove that marijuana use led to a reduction in opioid prescriptions. What’s more, the authors focused on data revolving around a specific older-age group (65 and older), so that leaves out focus on similar correlations revolving around other age groups. Still, the evidence is compelling, and there’s plenty of it. A study published in September, 2016 showed that people were slightly less likely to test positive for opioids after a state legalized medical marijuana. Furthermore, the results of a small survey released in 2017 revealed that 63% of patients reported being able to replace their pharmaceuticals with marijuana – including opioids, sedatives, and antidepressants – when given legal access. Is the swap a perfect solution? Of course not, but it can certainly be an upgrade for many. If cannabis wasn’t an effective pain reliever, drug companies wouldn’t be trying to harness its power or fight against legalization. That’s not to say that cannabis is a cure-all that suits everybody. In one study, Dr. Mark Olfson, a professor of psychiatry and epidemiology at Columbia University, found that pot users were 6 times more likely than non-users to abuse opioids. Of course this makes sense when considering the fact that those willing to use ANY drug are by default more likely to use even harder drugs than completely non-users – even if that chance is minimal for a large portion of drug users. Marijuana can also harm the developing brains of teenagers, studies show. Deciding whom cannabis might benefit is a delicate balancing act. “In this time when we are so concerned – rightly so – about opiate misuse and abuse and the mortality that’s occurring, we need to be clear-eyed and use evidence to drive our policies. Most Americans are in favor of marijuana legalization in one form or another. A recent Pew survey found that 61% of Americans support full legalization. 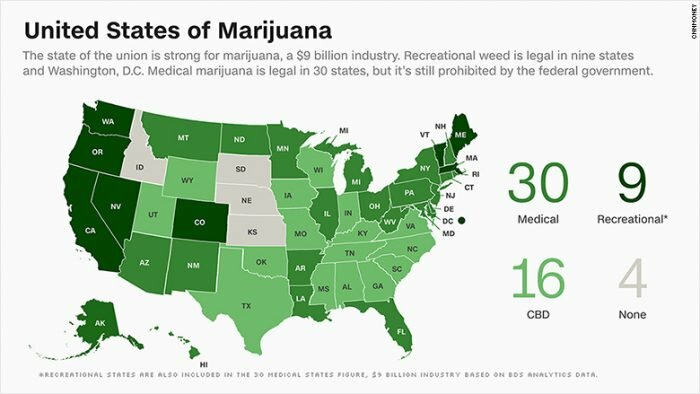 More states than not currently have cannabis laws – 8 states and the District of Columbia allow residents to use pot however they want, and more than 20 other U.S. states permit medical cannabis. And while neither Medicare nor Medicaid reimburses patients for what they spend on medical marijuana, the amount of money spent on the drugs in legal states fell by about 8%, so the costs of both treatments might be comparable. Medicare Part D would cover most of that, but a daily pain management dose of cannabis was only about $6 last year, and is likely lower now.